Not long after the Gold Rush of 1849, California became a state and made its capital in Sacramento. It seemed a logical choice. The city was served by the two of the state’s biggest rivers, the Sacramento and American, at a time when a lot of goods and people moved via river traffic. It was somewhat centrally located. But, there was the occasional flood. Every spring, the snowcap in the Sierras melts, leaving a significant amount of water in the Central Valley, where Sacramento sits. The city engineered a levee system to control the seasonal flooding. But, they were about to find out about the Pineapple Express and California’s megafloods. "When the levee breaks, I'll have no place to stay, mean old levee taught me to weep and moan"
In December 1861, the Pineapple Express rushed into town. Named for its origin, the atmospheric anomaly, a jet of warm air loaded with moisture picked up near the Hawaiian islands (where they grow pineapples, see? ), and dumped its water across California into the Central Valley before it encountered the snow laden peaks of the Sierra Nevada mountains. The warm air blew, battering all of California and the West Coast from Canada to Mexico. The storms lasted 43 days. The Native Americans recognized the signs and headed for higher ground, pointing to the tops of tall trees to indicate the height of the impending flood. The first generation of white settlers, secure behind the levees they had just built, were not buying it. Two decades of drought were over. It was a time to dance in the streets. Big mistake. The water came rushing down the mountains from the snow melting and entered the city of Sacramento from the east. The levees made to protect Sacramento from flooding had the opposite effect and acted like a dam. The city found itself under 30 feet of water. A chain gang was sent to breach the levee, dropping the flood level to 6 ft, but the city stayed underwater for six months. In January, governor elect Leland Stanford is said to have rowed a boat to the state capitol for his inauguration. He was to move, along with the state legislature, to San Francisco until the city dried out. It was a megaflood. It was the worst flood ever in California and one of the worst floods in America, up there with the 1889 Johnstown Flood in Pennsylvania and flood from Hurricane Katrina. Enough water collected in the Central Valley to form an inland sea. Geological evidence indicates California suffers from megafloods every hundred years or so. A quarter of the cattle in the state drowned. One of every eight homes was lost. Thousands of people died. The young capital was devastated. California was bankrupted. The Central Valley was the ocean floor eons ago. With mountains all around it, the coast range to the west and Sierra Nevada mountains to the east, the only outlet for high waters is the Sacramento River. Since the river is mere 10 feet above sea level at Sacramento, it is in no hurry to drain the valley. In times of flooding, the Central Valley is like a giant, clogged sink. For most of geologic time, the Central Valley was largely wetlands, 450 miles long, and a haven for waterfowl and stop for annual bird migrations. The sky was so thick with birds that hunters could fire up and hit them without aiming. 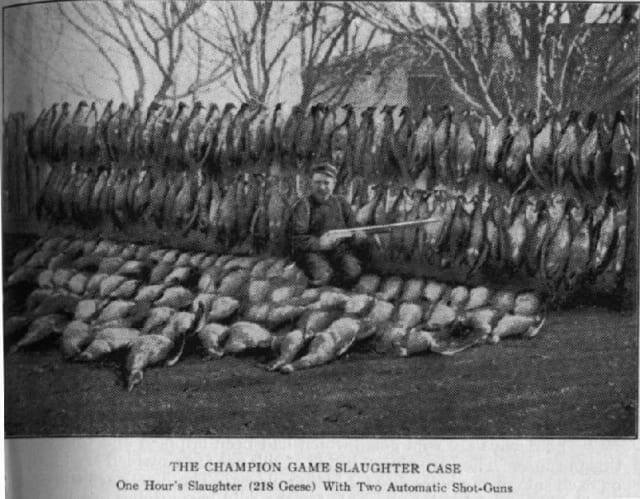 With the advent of pump shotguns in 1880s, “market hunters” were able to shoot over a thousand birds a day. It wasn’t until 1918 that the Migratory Bird Treaty of 1918 tried to stem the slaughter. However, with modernity, the loss of habitat poses at least an equal threat. The modern levee system, which confines the rivers to their banks, has had a disastrous and unintended consequence for the wild salmon, according to our guide. The flood plains, seasonally underwater when rivers overflowed their banks, had been where salmon fry hatched upstream and found abundant food and refuge in shallow waters, thick as soup with organic matter. Pausing in flood plains fortified them on their journey into the ocean, where they could reach maturity. The levees deny the baby salmon a rest stop, so many of them perish. California salmon stock declines as a result. The California Gold Rush of 1849 gets a lot of credit for jumpstarting California and leading the area into statehood. Destruction preceded construction. After the nuggets were scooped up from streams, prospectors had to extract it from the ground. Pickaxes were too slow. Why not aim a giant water gun at a hill and wash off the dirt off the veins of gold? It was a really bad idea. 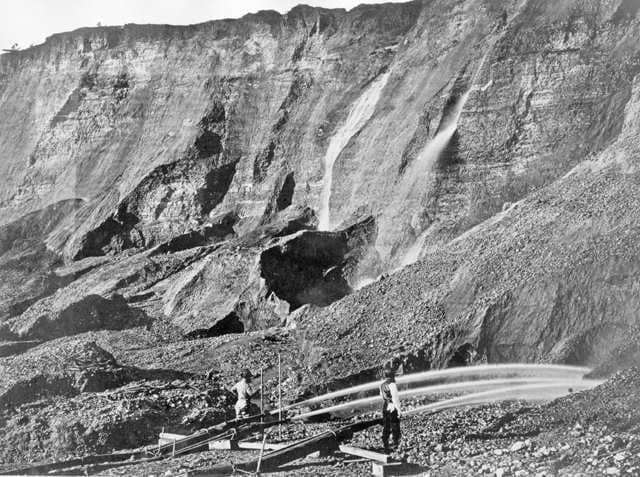 Not only did it wash away quite a bit of the gold, but “hydraulic” mining, as it came to be known, washed away entire hill sides. The dirt, stones and uprooted vegetation clogged waterways, raising levels of surface water. The reduced drainage magnified the effect of subsequent floods for years. 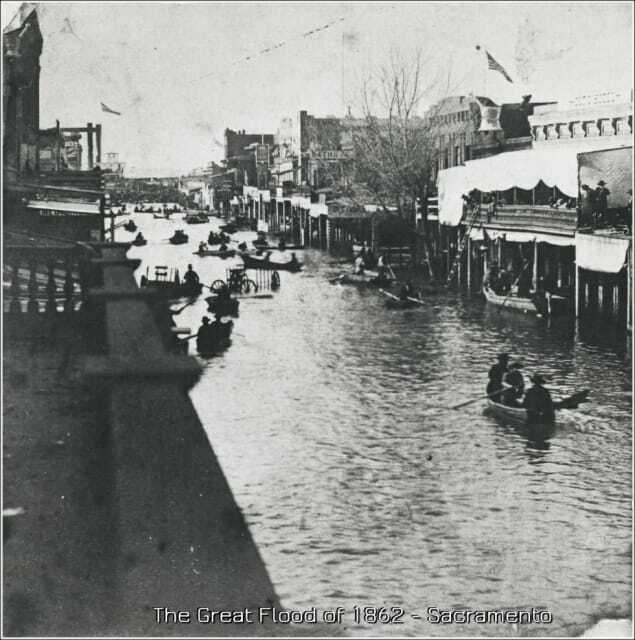 During this time, Sacramento streets were below the water level of the Sacramento River. The separation was due to the levees. 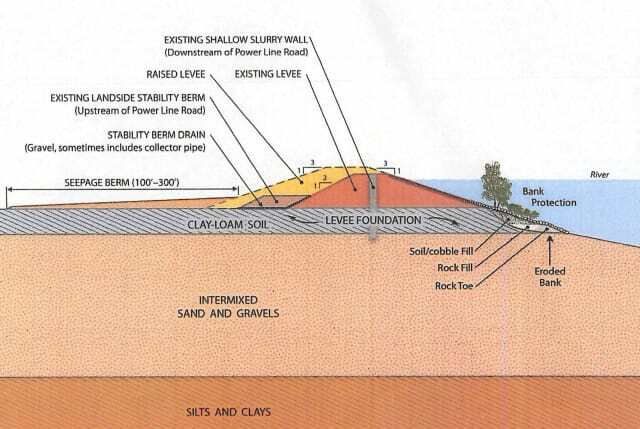 Most of the levees were “dry” levees, meaning their materials and construction were of the type to withstand seasonal water against them and may have been damaged by being wet for a long time. Draining the swamp, the natural condition of most of the Central Valley, was the civilizing thing to do. Through a series of legal acts in the latter half of the 19th century, the Central Valley was tamed and drained for farms. The soil turned out to be the most productive in the country, having been enriched by all manner of water and wildlife for millions of years. The Central Valley quickly became the most productive farm land in the country. To this day, it produces a wealth of products. It’s No. 1 in almonds and walnuts, for example. Although, nowadays, the nutrients often come from synthetic fertilizer. Water, the lack of it or too much of it, continues to be California’s vexation. To the Central Valley, too much of it happens almost annually. 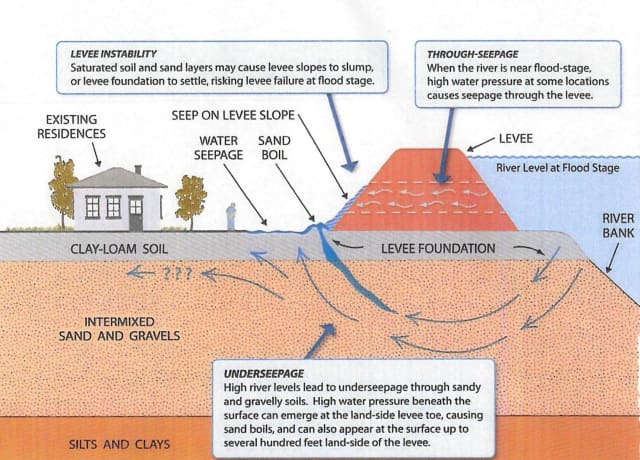 The levee system is mostly successful at keeping the water out of the streets, homes and businesses. In addition to the levees, the Sacramento River management system includes hundreds of miles of channels. While not as picturesque as the canals of Venice or Amsterdam, they serve their purpose working in joint with the levees. They do manage to control the flow so water doesn’t all well up next to a levee or leak into the streets. 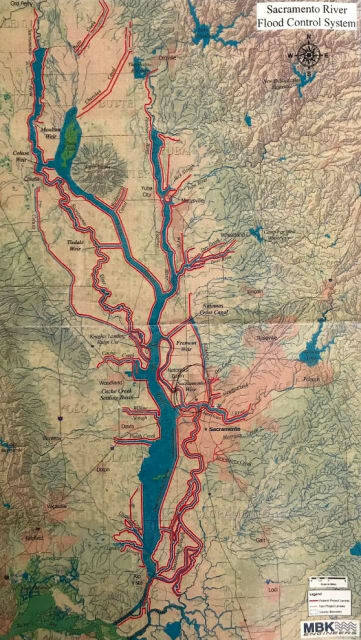 Over 1600 miles of levees (shown in red) keep the Sacramento River system from flooding California’s Central Valley. About a tenth of that distance is around Sacramento, the state’s capital. In addition, hundreds of miles of channels rout the water away from and around the city. The engineers talk of letting the water out from the levees, in case of an overwhelming surge, into rural areas where “there’s hardly anyone” so urban dwellers stay dry. Without such a system, there could be more than 10 feet of water on the streets every spring. That’s when the snows of the Sierra Nevada melt. Known as California’s water tower, the Sierras can have over 30-foot snowfalls. Since the megaflood of 1862, there have been numerous smaller floods. After millions of dollars and many flooded springs, the elaborate system of levees, levees breaks, run off plans, etc., has mostly done its job. Sacramento’s last record flood was in 1986, when the Pineapple Express again paid a visit. The flooding tore bridges down and breached levees in several places. Approximately 50,000 people were evacuated and 13 died. “Sacramento has been the second most at-risk city for flooding behind only New Orleans,” Pinter, who was our tour guide, said. St Louis, on the banks of the Mississippi, an even more scary threat, is possibly third. The volume of water carried by the meandering Mississippi over largely flat plains has been a perennial headache for thousands of miles through the country, including enough errant flow to wash New Orleans completely off the map, as it almost did during Hurricane Katrina. Our guides point out that the Mississippi levees held. It was the levees on Lake Pontchartrain that failed. That singular event, the first to endanger a major American city, was at the same time a cautionary tale for Sacramento. California lawmakers saw fit to immediately pass legislature and fund levee improvement projects. As residents of risk-prone areas often do, Sacramento residents downplay the danger of flooding. Despite warnings of deadly megafloods that occur every 100-200 years, they seem to take security in the intricate, large scale levee/channel system like a wall protecting them from an invasion between them and the water. There are houses, no doubt with families, built on stilts on the wrong side of the levee. Our guides shake their heads. What can you do? It’s private property. Many of the homeowners built by the rivers before laws forbade it. The levees are so trusted that landowners on the protected side have built right to the top of the levees on the protected side. Our bus rolls along the top of one, which has a two lane blacktop. The river, at a safe low level—it’s near the end of our dry season—runs alongside. It seems to be biding its time.